The physicists who invented the nuclear bomb worked out of Los Alamos in New Mexico, but the people who did the dirty work of making the bombs were in Hanford, Washington. Throughout the Cold War, Hanford churned out plutonium for our nuclear arsenal. It was also, conveniently, a place to experiment with radiation. Today, Hanford is the most contaminated radioactive site in America—the site of a massive (and troubled) cleanup effort. Radioactive material is still accidentally leaking into the ground. 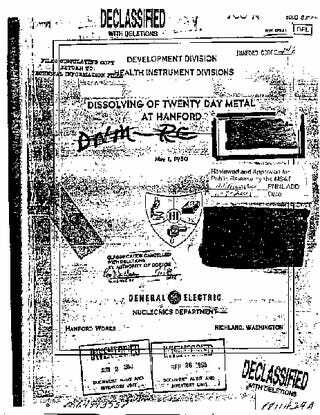 Though Hanford’s plants routinely released small doses of radioactive material into the air, most of this damage came from an event in 1949 called Green Run. Green Run was a secret Air Force experiment that released Hanford’s largest single dose of radioactive iodine-131. On the night of December 2, 1949, at the behest of the military, scientists at Hanford let 7,000 to 12,000 curies of iodine-131 into the air, where it rode the wind as far as 200 miles. For a sense of scale, the Three Mile Island nuclear power plant accident released an estimated 15 to 24 curies of iodine-131 and the Chernobyl accident 35 million to 49 million curies. The Green Run stayed secret until the 1980s, when it was revealed by Freedom of Information Act requests from local newspapers. The military details are still classified. More than half a century later, suspicion and controversy continue to lurk around Green Run, especially among the residents who lived downwind of Hanford. There’s still much that we don’t know about the Green Run, but here is what we do. The B reactor at Hanford under construction. When Hanford broke ground in 1943, residents nearby in eastern Washington knew it was a war construction project but not much else. Under the then-secret Manhattan Project, Hanford’s reactors produced the plutonium for the first nuclear bomb, detonated at the Trinity site in 1945, and Fat Man, dropped on Nagasaki. Only after the war was Hanford’s true purpose widely known. As the U.S. entered the Cold War, Hanford grew. Its nine reactors together processed enough plutonium for 60,000 bombs. Rural eastern Washington became the Atomic Frontier. Hanford was always more than a production facility; it was also a research complex. Up to 1,000 animals were housed on a farm near reactor F for experiments on the effects of radiation. The animals included fish, dogs, pigs, sheep, and even alligators. Sheep, especially, were given feed with iodine-131, the same radioactive material that the reactors were discharging into the air. Testing a sheep’s thyroid for radiation. Carl Gamertsfleder, then Hanford’s Health Instruments Deputy Chief, later told the Spokane Chronicle, that the “green” order came from the military, who assumed the Soviets were rushing to produce nuclear bombs. If the Soviets were short-cooling their fuels, the radioactive results might be spotted some distance away. So Air Force wanted to fly planes behind a radioactive test plume, to test out their own instruments. In the decades since, committees and researchers have revisited the question of whether the Green Run’s iodine-131 endangered the health of people living downwind. The answer, according to official sources, is no. Iodine travels through tainted food and milk, and the Green Run happened in winter, when few people were harvesting vegetables from the ground and few cows were grazing. A Congressionally mandated study could not find a link between thyroid disease caused by iodine-131 and releases of the material by Hanford, during the Green Run or otherwise. But, as secret government experiments do, the Green Run bred suspicion and mistrust. In 2005, a lawsuit filed on behalf of 2,300 downwinders finally had its had in court. Of the first six plaintiffs, two who had thyroid cancer were awarded $500,000 in damages—too little for the rest of the cases to continue. That’s pretty much where the story ends with the Green Run, a largely-forgotten episode of history in a largely-forgotten place. But Hanford still bears the scars of the Cold War, and the Green Run is an unsettling example of what the government has done in the name of keeping its citizens safe.